In this edge of the seat thriller set in a fracking North Dakota boomtown down on its luck (more perilous than the wildest stereotypical caricature imagineable about the South Bronx), two estranged sisters are driven to extreme risks to find enough money in one week to pay back the mortgage of their dead mom’s home – the only ray of light in their dreary lives. Started working on this review as I was shaking off the willies from watching the perils facing the female characters – moms, their daughters and their female friends, neighbors and acquaintances – in this superb movie, grisly yet eloquent if you can imagine, written and directed by Nia Dacosta primarily about two sisters whose fates seem to be repeatedly at risk no matter what they try to do or actually do right. 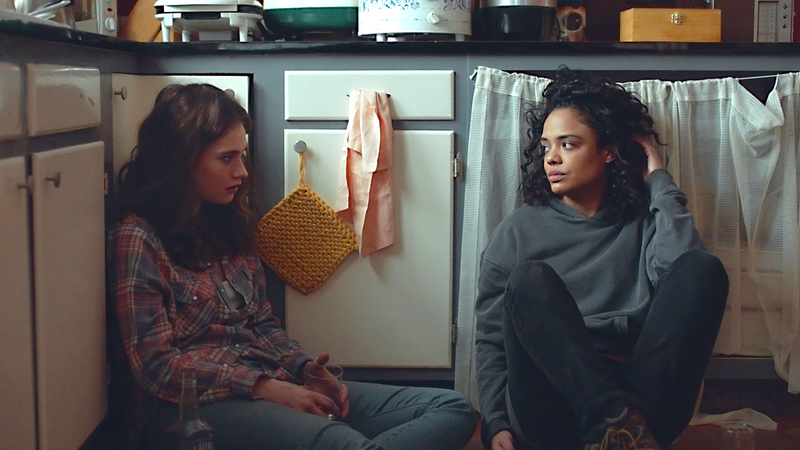 The perils plus the resilience of the two sisters, Tessa Thompson as Ollie and Lily James as her sister, Deb, had this viewer on the edge of his seat as the plot was moving inexorably toward a finale ripe for something grisly to happen. Which one isn’t going to make it? Oh, no – neither one! Oh, my god, did she/they really survive that one!?! Although Writer-Director Dacosta’s story focuses on Ollie and Lily, bickering with each other that never seemed to end, the backdrop is this looming, loathsome, economically depressed fracking boomtown in North Dakota (though the film was shot on location in Texas with ace veteran character actors whose characters personally intertwining with the sisters’ dramas, created a rich, thick mosaic of an opiold-wravaged town worse than the worse stereotypes imagineable about life in the South Bronx. Two of the standouts in an ensemble of savvy supporting actors in big and minor roles as townees with twisted fates include: James Badge Dale as Ian, the father of Deb’s son – loser, loser embedded my mind at first sighting until I almost chocked on the stereotype because of a scene with him and Deb sharing an intimate moment, their foreheads touching, as he realizes he is too lost to help her. And, Actor Luke Kirby as Bill, a menacing, skanky, lowlife dope dealer threatening to harm Ollie, yet, I really believed he loved his daughter. Dacosta writes great dialogue and many scenes are suffused with emotion as well as just plain scary. When I visited Williston, North Dakota, the boomtown upon which LITTLE WOODS is based, I found the modern Wild West. Life in fracking boomtowns in America was shocking to me. The inequities abounded, especially when it came to healthcare and reproductive rights. I found millennial prospectors and an economy evolving as a result of new demands for more housing, more booze, more drugs and more women. I found a place that felt, and often truly was, lawless. Inspired to tell a modern day western about an evocative and deeply American place, LITTLE WOODS became the story of Ollie (played by Tessa Thompson), our reluctant heroine forced to work outside the law to get what she needs. The wide open, isolating and enveloping western landscape would be our home and at the center would be our problem – how do you overcome your suffering in a place like this? When your choices are only as good as your scant options, what do you choose? At the frontier, the unknowable space beyond civilization, there is LITTLE WOODS. This is Nia Dacosta’s first feature. Impressive!